Circle of algorithms: Learners hard at work during the UCT Algorithm Circle's three-day workshop. On 26 February, 75 school learners braved the heat to take part in a three-day introductory Python (a programming language) course hosted by the UCT Algorithm Circle, a new UCT Society started by postgraduate and undergraduate students in the Department of Computer Science. The pupils had no previous programming experience and ranged from grades six to matric, with the majority hailing from grades seven and nine. 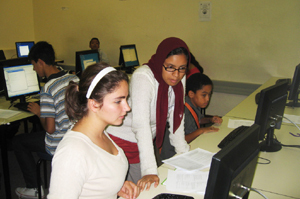 The aim of the course was to generate interest in IT using a first course in computer programming. While some schools do offer IT as a subject, many do not; and students arrive at university without any knowledge of the subject, explains UCT's Dr Michelle Kuttel. The course was offered completely free of charge, while IT company S1 picked up the Saturday lunch bill and provided a guest speaker to talk about careers in IT. Lectures for the course were prepared and presented by over 20 student volunteers, who tutored the pupils as they worked through the problems excitedly. Despite the extremely fast pacing of the course - as was to be expected from a course crammed into three days - the majority coped well, reports Kuttel. Some even exceeded the intended curriculum, in particular two grade-seven students who, by the end of the course, had written a network chat client. The club plans to run a similar course on the weekend of 14 to 16 August, and will be running lectures every Thursday for programmers of every level. Applications for the course can be made here.